On the 11th we anchored in Turners Creek, GA at position 32 00.856N, 080 59.366W. 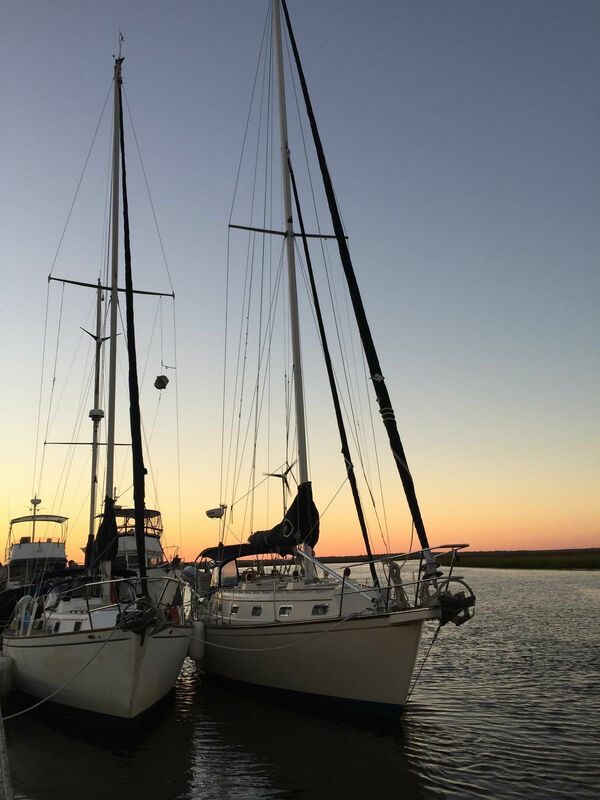 This was day one in the Georgia ICW and is one of our favorite anchorages along the way. The creek is very narrow and has a tricky entrance with a huge rock below the surface that must be avoided. The reward for making it in there is an anchorage with one of the best dive bars overlooking the boat. Cheap drinks, free popcorn and very strong pours…what else could you want? There is also a Publix grocery store, hardware store and several restaurants within a tenth of a mile of the anchorage. That set us up for traversing the 3 major shoal areas in the Georgia ICW, Hell Gate. The next day we went through Hell Gate at near high tide! Yay!!! We anchored at the Crescent River anchorage to set up for shoal area two…Little Mud River, and we were plagued by no-see-ums again…even worse than Mosquito Creek…sheesh! We timed the tide at Little Mud River just fine and then had a decision to make. Could we get through the third shoal area, Jekyll Creek and get anchored somewhere before dark, or should we lay up before Jekyll. The winds were unrelenting most of the day, and it was cold, and the next couple of days were bringing a frontal system with more rain and NE winds…come on man…we need a break. So we decided to divert to Brunswick GA and wait out the weather in Brunswick Landing Marina. We docked at position 31 09.055N, 081 29.993W. The marina is well protected, is close to a great bar, has free laundry, and free beer. Yes, you read that right…free beer…PBR on tap 24 by 7! We took a 2 day break from traveling and did boat work, laundry and beer drinking. It howled all the time we were there with bouts of rain. This also allowed us to wait for better winds to get through St Andrews Sound. You have to go into the ocean to get through this sound and with any kind of east wind component you get large rolling waves for more than an hour that have kicked our asses soundly! It looked like the 15th was light west winds, so we planned our departure accordingly. Of course, as soon as we left the marina the winds kicked up in the mid to high 20 knot range and temps were in the low 40s to boot! We got through Jekyll Creek with enough tide to keep from grounding, but as we started into the sound we were battered by the sea state. We made a decision to take an alternate route around the sound which had better protection from the seas, but it is not a well known route and it plagued by shallow waters. We had a rising tide, so Matt led the group through. It was the right decision. We pushed on and took a mooring ball in Fernandina Beach FL at position 30 40.227N, 081 28.129W. Winds still howling and cold as hell, but we finally made it to Florida! 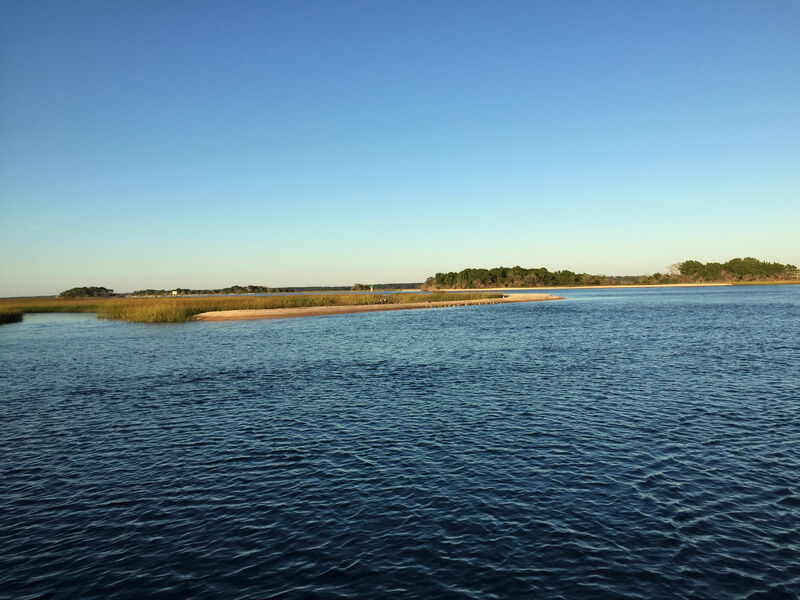 This entry was posted in ICW - Intracoastal Waterway on November 16, 2018 by bwehmer.